The following images were submitted for posting by Steven Greenberg of Fiskdale. Contact information below.--ed. So the CPA funds in total equal just over 5 million but we've gone ahead and spent so much that we still owe 4.2 million. What's wrong with this picture? What percentage of all that money have we spent on affordable housing? The habitat house is a tri-community project, is it not? In any case, there have been fund raisers galore for that project. I know we are only required to spend 10% on each of the 4 allowable uses: open space, historic, affordable housing, and recreation. What percentage of the funds brought in and the funds borrowed have gone to affordable housing? All the rest of those funds have gone to wishes, not needs. The article above makes it sounds as though the CPA paid for the Town Hall/Center School renovations. They actually paid for a SLATE roof, and windows that are NOT INSULATED. Did they also pay for the fancy copper down spouts? I don't know. We have acres and acres of bought land, which is not on the tax rolls, and we own it, so now we are being told that we need not only to be caretakers of the land, we need trails going to every neighborhood in town! Sorry. We actually have needs that outweigh the wants of those who spend and borrow every cent they can get their hands on, in our name. This is all really great stuff. I don't think anyone is saying the CPC hasn't been a good thing in Sturbridge for the last 11 years; but unfortunately, times have changed. I notice the flyer doesn't address the $4.3 million in debt that won't be paid off until 2030; nor does it say there won't be anymore million dollar projects that require more long term debt. How were they planning to pay for $2.5 million dollar ballfields? Selling brownies? The current reality should focused on paying off that debt and stop building new debt. so we have amassed 5 million plus in cpa funds over a 10 year period. 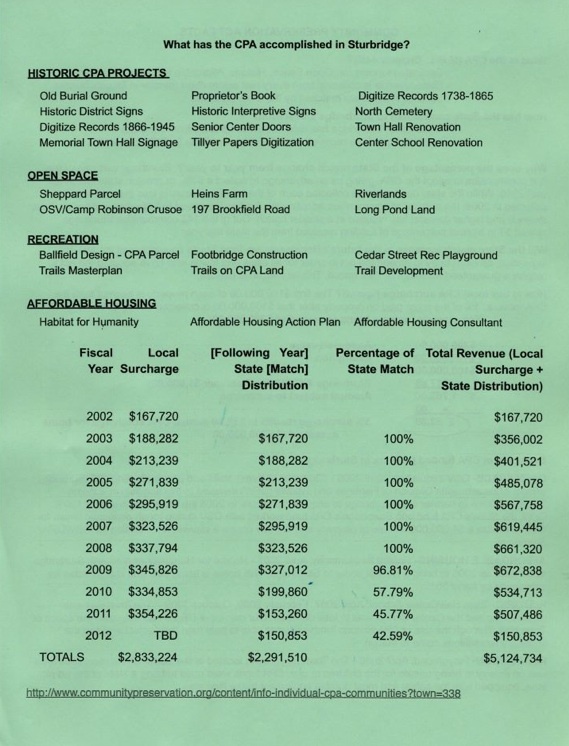 i see a list of what has been accomplished in sturbridge, but no cost figures for those projects. i believe it has never been clearly stated that we were always borrowing against projected income to fund these projects. why do we keep spending money that isn't there? i think it is time to stop allotting cpa funds to new endeavors until we play a bit of catch up on the millions we already owe. Great looking figures. How about some figures showing what we've SPENT! (and what we still owe!) ENOUGH! It's great to see this information. I feel I was mislead to sign the petition. We (CPA) took in just over $5 million and spent so much that we are now over $4 million in (CPA) debt, almost all of it for things that we just do not need, and it won't be paid off until 2030. It's easy enough for me to understand that this spending has got to stop! Just because there is a CPA doesn't mean that every project that is suggested has to be approved. Rather than repealing the CPA why not only spend the money that is collected and the matching funds. If you raise $100,000 and the state gives us $75,000 why not limit the spending to $175,000. Don't throw the baby out with the bath water. Anonymous wrote: "Rather than repealing the CPA why not only spend the money that is collected and the matching funds. If you raise $100,000 and the state gives us $75,000 why not limit the spending to $175,000." The answer is that we need the funds we will be collecting to pay the $4.2 million dollars we owe! We cannot afford to keep spending and spending. It's time to pay the piper! We can probably all agree that the CPA was adopted by voters at the right time in 2001. 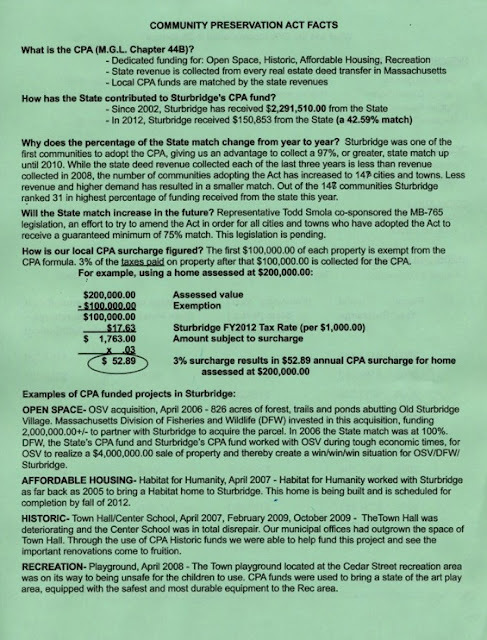 At the time, there were town buildings that needed renovation, and parcels on the town's priority acquisition list finally became available for purchase; the CPA allowed those acquisitions and renovations to take place and voters in Sturbridge generously supported that spending at town meetings in the last 11 years. 1) OSV parcel, balance due: $1,238,710, payoff is the year 2026. 2) Heins Farm, balance due: $742,880, payoff is the year 2026. 3) Stallion/Holland Road, aka The Riverlands, balance due: $542,000, payoff is the year 2017. Total Open Space Debt: $2,523,590. Town Hall/Center School Renovation, balance due: $1,824,578, payoff is the year 2030. Total of ALL CPA Debt: $4,348,168. The most important thing about this petition is it gives people a choice and allows them to decide, after 11 years, if they want to keep the CPA. This is a rare oppportunity, on a local level, in which voters can make a decision about controlling the spending and future debt. About "throwing the baby out with the bath water:" 1) If voters decide to revoke the CPA, it CAN can be brought back at a later date if voters wish - this revocation doesn't have to be permanent. 2)We have all seen "stacked" town meetings, in which proponents of certain projects get all their friends there to vote on a certain project, then once that vote is taken, those people leave. We saw this happen at the 2011 Special Town Meeting when the Saturday Town Meeting warrant article was defeated by one vote; the Moderator practically begged those people to stay and vote on other warrant articles but their purpose at the meeting was in their own best interest - not the entire town's best interest - we've seen this happen numerous times with other warrant articles over the years. Since we're talking about spending EVERYONE'S money through the 3% CPA surcharge, then EVERYONE should have a say in whether to keep CPA. One great thing about this petition is it finally brought the Community Preservation Committee out from behind those re-glazed windows at Town hall to talk to the masses. So, we didn't PAY for all the stuff the CPA bought? Who would a thunk it! Our money just sent them on a spending spree. I can sure think of a lot of stuff I'd like to buy and/or do, too. Only thing is, if I can't afford it, it ain't gonna be bought or done. Stop spending what we don't have! It's not like it's been spent on much of anything we really needed. People who can't afford their medicines or fuel, don't need to be buying slate and more woodlots. Carol's "rare opportunity" = take away any opportunity of funding future ballfields with CPA funds. Don't let her fool you. She hasn't fooled anyone. No one wants to use CPA funds for a ball field . Oh, I guess there are Some that would like to do that. That would not be a good thing. There are some girls who just can't say, "No!," and there are some girls who can. NO! No more CPA spending, until we pay the bills! NO! Aren't ballfields already slated to be installed in the town barn area? Will those fields be funded with CPA (oops, I mean borrowed) money? Actually, I don't want to pay for ANYTHING more that requires debt service that isn't absolutely necessary. 1) Route 131 waterline - that $154,000 a year and ends in 2031. 2) Wastewater treatment plant (ineligible SFR costs) - that starts at $106,000 a year and amortizes down until the entire debt is paid in 2030. 3) Burgess Elementary - this is a whopper - starts at $875,000 a year and amortizes down until the loan ends in 2031. Looks like the last payment in 2031 is $460,000. 4) Well #4 - almost $120,000 a year, ending in 2041. 5) Wastewater Treatment Plant - looks like roughly $370,000 a year unti 2031. They kept using the phrase "CPA funds" like those "funds" were there ready and waiting for some "worthy" project. That's how we thought those funds would be used. So how did we get into this 4.3 million dollar CPA debt mess? Suppose you've made it known that your kids "need" a swing set, and your caring neighbors chip and give you the price of a nice little set. Wouldn't it be insulting to take their money, letting them think that they've done something good by paying the necessary price, and then you go out and borrow a lot more for a fabulous outdoor gym set? I guess you could just try sending your neighbors the monthly bill, right? I totally agree that we have been misled about all the CPA "funded" projects and purchases. How can we keep spending money that isn't, in fact, there? We spent $800,000 for the Heins property in 2006 and still owe almost $743,000 on it five years later? Seems very irresponsible to me. Didn't I just see a planning board meeting where they were discussing buying more open space abutting the westville dam? Ms. Boubon suggested CPA funds could be used to make the purchase. WHAT FUNDS??? Stop the madness. I like the idea of revoking the CPA for one reason. When i first started getting involved in the town meetings and generally paying more attention to town politics CPA to me was almost like free money. The reimbursment by the state made it seem like a great deal. And "Community Preservation" made everything sounds great. Almost like if some spending was CPA it was somehow needed more than something that was not funded with CPA help. By removing the CPA i think the residents will think a little harder before raising the pink card in favor of spending. I would just like to point out that, during this past Monday's Selectmen's meeting, Mary Dowling brought up this petition to revoke the CPA and there was a general consensus by all five Selectmen that they support keeping the CPA. They decided they will be voting to make that consensus official this coming Monday - when the press is there. However, I wish correct one statement made by one Selectmen: she said, referring to the CPA surcharge on people's property tax bills, that "$50 will not break anyone." This statement was made almost immediately after Tom Creamer said that water/sewer bills had increased 68% recently. Ms. Selectman: Everyone does not just pay $50. I pay $200 a year; some people pay more. Whether revocation of the CPA passes or fails, the next step our citizen activist group will take is to ask voters to adopt another exemption onto the CPA. Currently, the town uses one exemption, which is that every property has $100,000 taken off the value of their property before the surcharge is calculated. A second exemption would benefit people who would qualify for low income housing or low or moderate income senior housing. Why? Because $50 DOES INDEED break some people. Based on your assessed value of your home (public record) your home is assessed at a value that should not result in a $200.00 CPA surcharge. You should have a surcharge at $89.97. Let’s not kid ourselves, most everyone in our society spends 50.00 a year frivolously. Maybe Ms. Selectman was trying to infer, rather than spend frivolously we should all take advantage of a terrific investment. Where can you invest a dollar today and receive 42 cents on that dollar tomorrow. Whether it’s a to go cup of coffee, a drive through happy meal, cable, the latest Nike sneaker, or a house on the lake with a cleaning service, most all of us spend more than we should on something we do not truly need. "...Let’s not kid ourselves, most everyone in our society spends 50.00 a year frivolously. Maybe Ms. Selectman was trying to infer, rather than spend frivolously we should all take advantage of a terrific investment. Where can you invest a dollar today and receive 42 cents on that dollar tomorrow. Whether it’s a to go cup of coffee, a drive through happy meal, cable, the latest Nike sneaker, or a house on the lake with a cleaning service, most all of us spend more than we should on something we do not truly need." Oh, sure! Other than that drive through Happy Meal or having cable TV, most of us hardly ever "go for a cup of coffee," and we don't buy Nike sneakers, have never had a house on the lake, and certainly don't have a cleaning service. We live in the REAL world. We don't appreciate others spending our money to get a 43% discount for unnecessary things. Hey, you're right, Anonymous! Thanks for correcting me. With property values decreasing, I'm sure the tax rate will increase so the town can pay its bills. The current property tax rate of $17.63 does not include the tax impact on the initial $9,000,000 debt service and the remaining $5.7 million debt service for the Burgess Elementary School. The average single family home share could be as much as $306 or more per year for fiscal year 2013, until the debt is paid (source: Sturbridge Assessor’s office; subject to change.) There's also the new debt for Well #4, Route 131 Waterline, and Wastewater Treatment Plant debt for those residents on public water and sewer; heck, those people just got done being hit with a 68% increase. So, $50 bucks here, a happy meal there...who knows, some families, maybe even yours, may have to cut out a happy meal or two, huh? Residents no longer have a CHOICE about that 3% surcharge anymore. They are REQUIRED to pay it until the year 2030. One of the reasons I supported adopting the CPA in 2001 is because residents could revoke it after 5 years if they wanted to; but I didn't know, and I'm sure many people didn't know, that once a municipality incurs CPA debt, that surcharge is STUCK on your tax bill until the debt is paid. I've learned a lot about the CPA in the last year, things I wish I had known before this debt was taken on; things I wish I'd known before voting at Town Meeting. And given the amount of people signing the petition, other residents feel the same way. My point in posting the previous comment was that not everyone pays $50, or has $50 to spend (where does one get Nike sneakers that cheap?) and $50 is a stretch for people on fixed incomes. Since I've been out talking with people, the line of demarcation between the have's and have not's in Sturbridge has become crystal clear, and it's a sad thing to witness. Your statement above, Anonymous, is out of touch, insensive, and frankly, pretty selfish. You talk about spending frivolously while some people could use that $50 to buy food. If the CPA is revoked, the town doesn't lose the state match; it continues because the surcharge continues until the debt is paid. But the match fluctuates so there's good reason to be cautious. The match was 100% in 2008, then 96.8% in 2009, 57.79% in 2010, 45.7% in 2010, and 42.8% in 2011. Have residents been on a spending spree for so long that they've forgotten how to be prudent and cautious? We are STUCK with that surcharge for the next 18 years. That's more than I, and many others, had bargained for. Carol doesn't like the fact that debt has to be repaid. Unfortunately, repayment of debt is a fact of life. If you borrow money to create a better lifestyle the money has to be repaid. Policemen, firemen and teachers expect to be paid for their services. Buildings have to be maintained. Roads have to be repaired. If you buy a $500,000 house wouldn't you expect to be in debt for a very long time? Why would you expect to purchase things and not have to pay for them. This was emailed to me this morning: "
Now why doesn't our Community Preservation Committee provide this kind of information on their website so voters know what's going on, Wally? This is from Provincetown, MA - imagine how much they raise from their surcharge revenues? They are $7 million in debt and have limiting spending to $300,000 - most telling is that bracketed sentence about the state match - what does Provincetown CPC know that our CPC doesn't know? And what do Provincetown residents know that we don't know about the debt? WAY MORE! 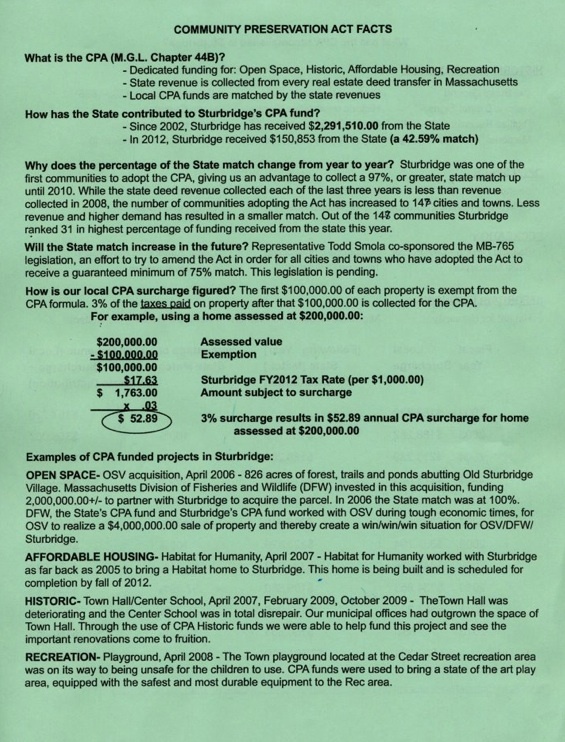 Sturbridge's debt is more than 50% of Provincetown's and we raised $354,000 for FY2012. Community Preservation Act (CPA) Funds come from a 3% property tax surcharge that is matched with state funds from a real estate transaction stamp tax. The Act requires funds be used on Affordable Housing, Historic Preservation, and Open Space preservation initiatives in Massachusetts communities with a minimum of at least 10% of funds going to each of these three categories. At the April 2004 Special Town Meeting, Provincetown voters ratified the CPA and voted to direct the uncommitted 70% of funds to finance affordable housing. The voters at the November 2008 Special Town Meeting amended that breakout to 10% in each category with 70% uncommitted and available for any category. At each Annual Town Meeting since 2005, voters have approved using CPA funds as detailed below. Given the projected debt service for prior approved projects and the limited available state matching funds [estimated at 25% for the next round and 0% thereafter], the Community Preservation Committee limited funds for the current grant awards to a maximum of $300,000. So, while it may look like we have a lot of funds in hand, those funds will be needed to pay off future debt service. View the Community Preservation Committee Agendas and Minutes Archive. Contact: Assistant Town Manager David Gardner"
How can the paltry sum of $50 be used today? 11- A new winter jacket or at least 2 new winter jackets at the end of the season. Reading the CPC info from Provincetown and comparing the priorities with those CPC priorities here in Sturbridge is embarrassing. Cut up our CPC credit card! Actually, Carol doesn't mind paying back what is borrowed because they're very worthwhile projects. What I don't like is how no information is ever dispensed from the CPC, not even on their webpage. The example from the Provincetown CPC is packed with information so voters can make informed decisions at Town Meeting - we NEED that information on ALL the debt we incur, but especially on the CPA because it's "extra" - we don't have to keep the CPA - we have the power to cut up that credit card. Residents will find an article in today's T&G. It says the Selectmen support keeping the CPA. At last night's Selectmen's meeting, Mary Dowling stated that if the CPA is revoked, "there would be no matching funds for new projects." That's a very broad statement that must be put into context: that statement applies only to new LOANS, NOT new projects, and I explain why below. We don't need loans if we plan, save, and spend the funds wisely. If the ballot question to revoke the CPA is passed at the local election on April 9th, this is what it means: the 3% surcharge on our property tax bills must continue until the debt is paid in 2030; the state matching funds also continue as long as there's one to be had. New projects can also continue while the debt is being paid down - BUT - they must be paid for within the spending limits of the annual surcharge revenues collected, the annual matching funds collected, and the existing balances in the local CPA fund - no more CPA debt/loans will be allowed. Those funds can then be spent or banked for specific projects over the next 18 years (until 2030) - including recreation fields - while the debt is being paid down. Sound familiar? Isn't this how we manage our own household finances? The current CPA debt, which makes up 8% of our overarching $49,000,000 debt, is with us until 2030. The surcharge revenues and matching funds continue, and spending on new projects is allowed if the CPA is revoked. Voters have control at Town Meeting over which projects they wish to spend on. So, based on Mary Dowling's reasoning and statement above, the ONLY reason to keep the CPA is to get matching funds on new loans. That type of spending is pointed at immediate gratification - get the loan, build it NOW. The CPA has been in Sturbridge for 11 years; where have you been? There are 365 signatures on the petition. This sends a very strong message that voters wish to control spending. Vote to revoke the CPA on April 9th!